Thanks! I'm not used to these types of boards so I think I replied to a post from over a year ago without mentioning what I was replying to. Good to read your words of wisdom here, Doc! Be sure to stop over at the Obadiah Oldbuck thread to let everyone know what is and isn't a comic book -- some of those Miss America issues, for example. Va-va-voom! That's one "dumb bunny" I'd never get tired of. Ok, I think I may see where this came from. If you got a lot of these Timely credits from the GCD I'm going to advise everyone to take them with a grain of salt. Alascia was almost exclusively an inker on the Timely staff and Powell was inking no one. Powell was a penciller with his own stable of inkers and background artists like Howard Nostrand, Marty Epp and George Seifringer. Powell did no inking for Timely. He was never on staff and could not have ever inked Vince Alascia who was exclusively an inker and not even a penciller. Doc, thank you for your welcome comments in this thread. The errors above, IIRC, come from the Wikipedia's entry for Alascia. I don't claim to know enough to correct them. I was all too happy at the time to hear more about Vince about his pre-Charlton days. I try to cite the sources I use for the write-up and certainly didn't intend to 1) take credit for the statements above or 2) repeat and distribute false information. I'm all too glad you stepped in to correct this mis-information. Had I had time to read it over more closely I would have noticed the odd reference to Powell as an inker! I was particularly glad to see Alascia's inking over Mike Becker. I know recently on the Timely - Atlas that Becker's name came up but I've never seen any of his jobs for Timely so was glad to catch him in Murderous Gangsters. Also, thank you for the Bellman ID. I knew I had seen that penciller somewhere and you IDing Allen, I see his work there now. Now, I wish you could help me with the ID on another post from a year or more ago, it's from Astonishing # 11's third story: 9790 Reign of Terror. Who pencilled that? These are the kind of questions I wish I could ask on the Timely-Atlas list all the time and not become a pain plus the board are a lot easier at handling image hosting. Could you please help ID this work? I can scan more of this 4-pager if you'd want me to. Welcome to the boards and you're sticking around for a while. Ah, another good new poster lured into the GA forum! Excellent. That would explain it. Whoever wrote that entry up "definitely" culled it from the GCD. And thus the errors get propogated into online encyclopedias now! $%#@$#!!!! I like Mike Becker's art agreat deal and not having those Murderous Gangster issues, I now look foward to tracking them down. Becker was a staff artist at Timely (along with Alascia) and I never have been able to connect his work with a discernible inker there (there were so many on staff, both good and bad). His style is a strong one and easily recognized. Yeah! Allen doesn't have a clue as to why he signed only some of his stories. It wasn't something he really thought of (signing) and perhaps he signed the stories he thought he did a better job of. That looks to be an artist by the name of Sy Grudko. Grudko was on the Timely staff starting in about 1947. 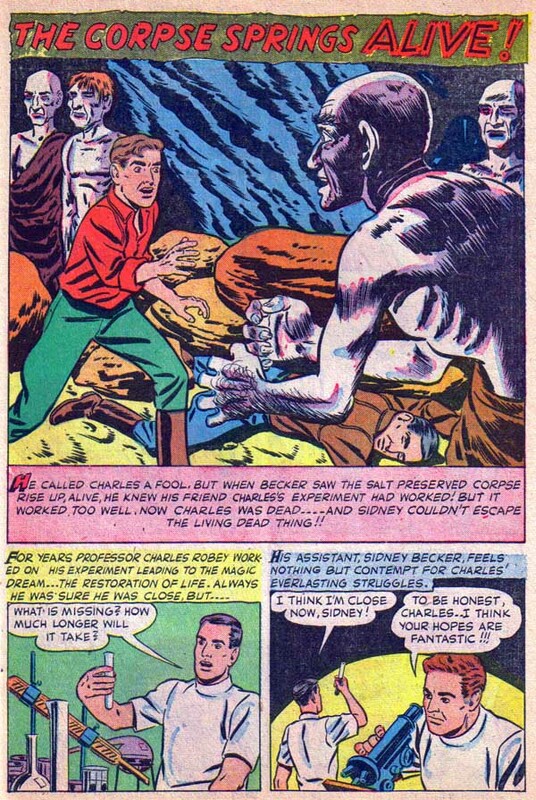 He was there until the staff was let go and he freelanced for Stan Lee up through about 1952-53. The very first thing he did at Timely was a 2-page Human Torch filler that may or may not have ever been published. Were you on the old Timely-Atlas list? Artist ID questions were a big part of that list that I loved to answer when I could. I say "were" because the 8 year-old Timely-Atlas list was inexplicably deleted from the Yahoo servers 3 days ago taking the largest collated Timely-Atlas archive in the world with it. It is with 100% certainty that I can say it was the largest repository of accumulated Timely-Atlas knowledge and data in the entire world. We don't know what happened but it's an enormous tragedy and loss. The list archives have been saved by several listers so the data is not gone forever but the ability for someone to scroll through the list's history is now gone. But...not to worry! I've started a spanking new Timely-Atlas group with myself as the list-owner and moderator and I invite anyone interested with the history of Timely-Atlas from both a creator standpoint to the actual publications themselves, to join us! Most of the participating list members have re-joined and in addition we've pulled in some new blood. I like Mike Becker's art agreat deal and not having those Murderous Gangster issues, I now look foward to tracking them down. Let me know and I can send you the complete Becker story scanned from that issue of Murderous Gangsters. I must say that I would agree the story we're discussing is not the best job turned in by Allen. Somehow, I find that his work on Western (while not very Western-like, that is not in the vein of say, Tumlinson) is some of Allen's best work. 9790 Reign of Terror - That looks to be an artist by the name of Sy Grudko. Grudko was on the Timely staff starting in about 1947. Never heard of him! No wonder I didn't figure out who it was. Thanks. It'd been driving me nuts. Glad that the same week as the Scream was found again so is Grudko. Were you on the old Timely-Atlas list? Artist ID questions were a big part of that list that I loved to answer when I could. <snip> I've started a spanking new Timely-Atlas group with myself as the list-owner and moderator and I invite anyone interested with the history of Timely-Atlas from both a creator standpoint to the actual publications themselves, to join us! Yes I was on the old list and yes I've rejoined last week already. I tend to lurk and listen there and don't dare come in with my ignorance and ask for help with ID over and over again. I guess I should speak up then, huh. I've not been able to pin down anything from his Timely staff days, though. Of course you should! What's your real name? Have you ever posted there? That's what the list is for. Exchange of info. Nothing I enjoy more than having an outlet for all the useless information I have! Thanks for the scans. The Vince Alascia inks make Mike Becker's pencils almost completely unrecognizable. The man in the very last panel on the very last page is a typical Mike Becker face, the only really recognizable one in the entire story. This makes me realize that what I know to be the Timely becker may in fact be almost pure Becker. Oh! before I forget, what is the issue number and date of those scans? Realistic's (Avon) Murderous Gangsters # 3 from March 1952 (published Quarterly). This is the lead story. I agree that Alascia shows up strongly in this story. I'll be quite lazy today as instead of transcribing as I usually from my sources, I will provide you with scans, hopefully readable for all. First, let me mention that if you want to learn more about Bill Fraccio who recently passed away, you need to go back to AE 29 for an interview with Fraccio. To finish the coverage, you will have to buy a set of TTTT. Briefly, about Hollingsworth: "Alvin Hollingsworth (b: 1928) was an Afro-American comic book artist, active in the field during the 1940s and 1950s. Born in New York City, he was a high school classmate of Joe Kubert's at the High School of Music and Art. By the age of twelve, he was working as an assistant at Holyoke Publishing Company and helped on Catman Comics. A year later he began doing illustrations for crime comics. Hollingsworth drew for several companies until the mid 1950s, including Fox ('Bronze Man', 'Rulah Jungle Goddess'), Fiction House ('Suicide Smith'), Feature Comics (romance), Spotlight (war), Story Comics (crime) and Trojan (crime and romance). In the mid 1950s, he worked on newspaper comics like 'Kandy' (Smith-Mann Syndicate), 'Scorchy Smith' (Associated Press) and 'Martin Keel' (with George Shedd). Hollingsworth left the comic strip field to pursue a career in the world of fine art. From 1980 until his retirement in 1998, Hollingsworth was a full Professor of Art at Hostos Community College of the City University of New York. Hollingsworth died on 07/14/2000." That book is really making me miss my pre codes! That was always one of my favorite titles, and I had 90% of the run. That issue was fun, I like hollingsworth a lot, I thought Cameron ws better at Ace though. They really started getting good at around #9. Thanks again for the visit to 1952! A lot of usual DC suspects had their hand in this issue. I will try to highlight the two lesser known personel in this issue. "A Mercurian dictator attempts to export his government to the outer planets. An all-powerful alien plays games in which whole worlds are destroyed. A nuclear fusion experiment threatens to melt Earth's entire crust. Who ya gonna call? The Knights of the Galaxy, of course. These 30th century do-gooders, patterned after King Arthur's Knights of the Round Table, were ready at the drop of a hat to hop into their individual spacecraft and rocket off from their base on the planetoid Gala, to right wrongs wherever they may be found. Incidentally, Lyle was the only Knight of the Galaxy who was at all developed as an ongoing character, and thus the only one for whom the reader had anything resembling sympathy. Though Lyle would sometimes grieve for his fallen comrades, to the reader, his fellow Knights were mere props, discarded without a thought whenever convenient just like some of the less famous of King Arthur's 99 knights. In fact, even their names were mentioned rarely, and usually just in passing. The series was never revived, unless you count a few 1970s reprints — those eight stories (each of which was only 8-10 pages long, by the way) were it. It's not a highly influential series, nor a cult classic. But it's well crafted and worth noting, as are Chris KL-99, Darwin Jones, Captain Comet and all the other 1950s series in Strange Adventures and Mystery in Space, for their place in the development of Julie Schwartz's career." Synopsis: "The Master of Doom returns, and sends Lyle and Gala back in time to 20th Century New York City. Space opera on a grand scale. This is a minor tale, which does not do much with its time travel theme. It is interesting that the entire planetoid of Gala returns to our era; the panels showing it flying over New York City's skyline are surrealistic. The way the Knights deal with their problems in the past and return to the future in stages is also interesting, especially the handling of Alpha Obscuri. I also thought the treatment of energy in the tale was interesting. We all tend to be more conscious of energy since the Energy Crisis of the 1970's; but here is an early tale that stresses it. Infantino shows the skyline of New York City melting in the heat. This anticipates the many wrecked skylines of Ranagar he drew in the Adam Strange stories. Infantino also includes many fine starscapes, filled with the Knights' spaceships; the one at the upper left of page 5 is superb. Two of these include thick lines of radiation anticipating the Aurora Borealis and other sky lines of the Adam Strange tales to come. The starscape depicting Gala fading out, starting its journey through time is also striking. It is an image of remarkable stillness. It is the Infantino tradition of sketchily drawn objects undergoing transitions." For more MiS synopses, please check out this link. John Giunta drew the next story. Comic history hasn't been kind to John Giunta. Born in 1920 (deceased 1970), Giunta worked in comic books from the 1940s through the 1960s. 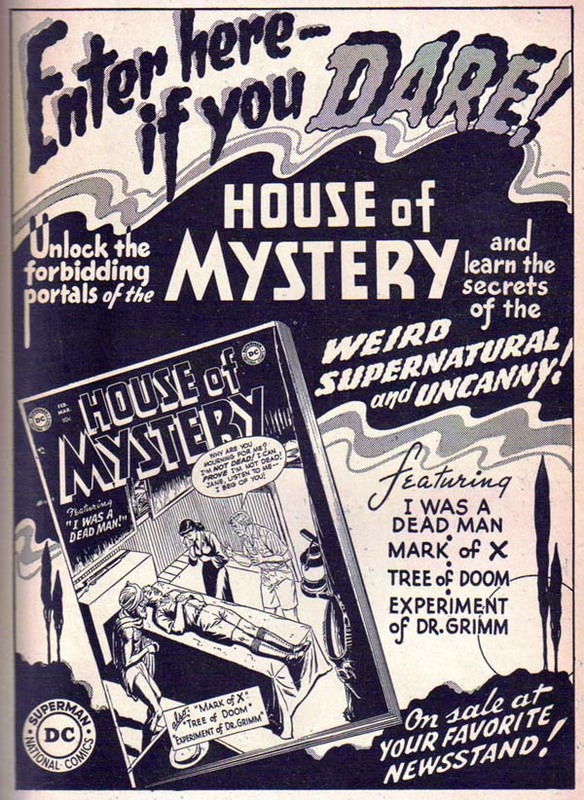 He cooperated on horror titles like 'Tomb of Terror', 'Chamber of Chills' (Harvey), 'Journey into Mystery' and 'Weird Tales' (Marvel). In 1944, he drew the first comic adaptation of O'Henry's 'Cisco Kid' , published by Bernard Bailey/Swappers Quarterly. In the early 1960s, he was a regular artist on 'The Fly' for Archie Comics. He also cooperated on titles like 'Thunder Agents', 'Air Fighters Comics' and 'Phantom Stranger'. Giunta is probably more remembered for the factoid that Frazetta began his career when he was sixteen years old, assisting Giunta at Bernard Bailey's studio, specifically on his “Snowman” story in TALLY-HO COMICS (December, 1944). Dan Atkins on Guinta: He was an old-timer. He did the one story where Dynamo is running and dressed in uniform, as a soldier or something, with a tank. He did quite a few. He also did science-fiction illustrations for Galaxy. The hidden gem of this issue is the Mooney tale: Cowboy on Mars. Synopsis: "A cowboy, a member of the Cattleman's Protective Association, is transported to Mars, where he enters a Martian rodeo and tracks bad guys. Entertaining blend of the Western and the sf story. Rubin left an opening at the end, suggesting that the cowboy might return to Mars and fight bad guys again, but as far as I can tell, no such sequel ever appeared. This story shares many formal elements with Rubin's next story for the magazine, "The World Where Dreams Come True". Both are about human heroes who are accidentally transported to another planet, Mars here, Venus in "World". In both tales, the hero gets involved with a contest, one that involves a lot of imaginatively developed alien animals: the rodeo here, the Olympics in "World"." Our coverage will emphasize Woody Woodpecker as he is our cover star. We already discussed Woody Woodpecker while covering Four Color 383 featuring Andy Panda as Woody first appeared in an Andy Panda short. Please refer to that entry for screen shot of that very first cartoon appearance. "Walter Lantz decided that one new cartoon star wasn't enough for his new cartoon studio. He wanted a character he was sure would develop into a full-fledged star. So he and his crew came up with a new adversary for Andy Panda and his father to match wits with in their new picture: a crazy, red headed woodpecker. The plot of the cartoon involved the woodpecker drilling holes in the Panda family roof, and Andy Sr. and Jr. trying to get rid of it. Of course, like all of the other characters at rival studios that would soon develop into full-fledged stars, being released in 1940, the woodpecker had problems. The head of the Universal short subjects department, Bernie Kreiser, rejected the new cartoon, entitled Knock Knock, telling Lantz that the woodpecker was the ugliest thing he had ever seen. "You're not paying for these pictures," Lantz told him. "All you're doing is distributing them, so release him, because I'm taking a chance". And so he did. The cartoon was a smash with moviegoers, and Kreisler asked for a series of comebacks, pretending nothing ever happened. Lantz has said that a peculiar experience inspired him to create the character. He was on his honeymoon at Sherwood Lake, and throughout the night, a redheaded woodpecker was drilling holes in his cottage roof. Of course, it seems to be just a Hollywood tall-tale, as Lantz was on his honeymoon in 1941, almost a whole year after Knock Knock was released. With the character's first comeback film, Lantz needed a name for the character, and decided to go with 'Woody Woodpecker', which was also the title of the film. In this film, Woody goes to see a psychiatrist, after all of the forest animals call him crazy. Most of Woody's early pictures involved him trying to get food, gate crashing an event, or heckling some unworthy slob. Like all characters, Woody's design changed after his first few years, to something cuter and more streamlined. The 1944 masterpiece, Barber of Seville, introduced the new look for Woody (designed by Emery Hawkins), which would remain the same for the rest of the 1940s. 1944 also introduced another important factor in Woody's career: his long-time adversary, Wally Walrus, in The Beach Nut. Wally would be the key character Woody would match wits with for many years (similar to Warner Bros. Bugs Bunny and Elmer Fudd). Woody was one of the most popular icons of the 1940s, and even got a song created for him, entitled (what else? ), The Woody Woodpecker Song. It was recorded by Kay Kyser, and sung by Gloria Wood and Harry Babbit, in 1948. The song was a smash hit in June, 1948 (selling over 250,00 records within ten days of release). To help cash in on the popular tune, Lantz had the song rushed into his latest picture, Wet Blanket Policy, with Wood and Babbit supplying vocals. The cartoon has the honor of being the only one ever to be nominated for an Oscar for Best Song. If that's not enough, Wet Blanket Policy also introduced another of Woody's co-stars, Buzz Buzzard, the conman always willing to filch Woody. Lantz had to close the studio for a brief period due to financial reasons after 1949. Beginning in 1951, Woody would be Lantz's only star until 1953. With Ben Hardaway gone, Lantz had to get a new voice for Woody. When Lantz was holding auditions for the voice, Grace Stafford slipped in her recording of Woody. When Lantz picked that particular recording for the voice, he was shocked that he had picked his own wife! Woody went through several design changes in the 1950s, courtesy of Paul Smith and Alex Lovy. The new look for the new Woody is said to have been done by Laverne Harding. Woody was now cuter, slimmer, and had a comb similar to Warner Bros. Road Runner. Woody's popularity seemed to be growing as the years went on. In 1957, Walter Lantz signed a deal with ABC and Kellogg's to do a half-hour programming of his theatrical shorts, entitled The Woody Woodpecker Show, with Woody as the lead character. Lantz himself would be in the show, not only in the opening and closing, but he even had special segments during the program. The first years of the show featured segments entitled A Moment with Walter Lantz, in which he showed how the cartoons from his studio are really made, with an animated Woody to help him along. Of course, with the constant pecking of heads and explosions, ABC felt the show needed more educational value in the program. By the early 1960s, the "moments" were replaced with a corny segment called Woody's Newsreel. No comedic value whatsoever were in these, it was just black-and-white footage of various subjects, like sports, aviation, and farming, narrated by Lantz. In 1972, the Woody Woodpecker theatrical cartoon series came to an end. After 32 years, and 198 shorts, Woody was put into a retirement from show biz. Woody and his pals still lived on, thanks to television distribution and merchandising of them. 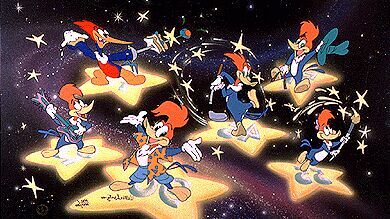 In 1999, Universal wanted to cash in on the characters, so they hired a bunch of random people to put together an all-new look and show for Woody Woodpecker and his friends. This new series was called The Woody Woodpecker Show. Woody was voiced by Billy West, and starred in cheaply animated and written cartoons. The most likely reason for the show's immediate failure is that the people Universal hired really didn't care about the Lantz cartoon characters at all." As for Woody's presence in the comics, "in 1942, he started making a few guest appearances with Andy Panda or Oswald the Rabbit in Dell's New Funnies, an anthology title that featured the Lantz characters. Within a couple of years, he was its star. 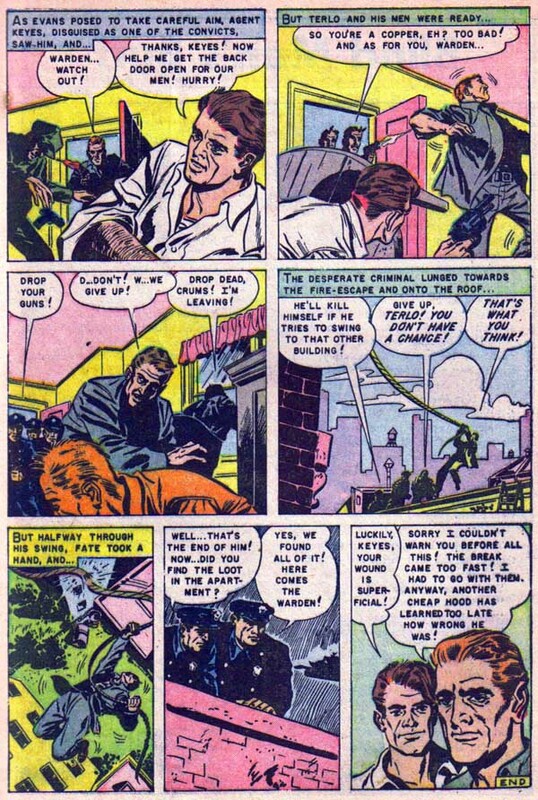 In 1947 Dell started devoting a few issues of Four Color Comics to Woody. 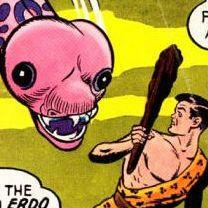 By 1952 he was in his own regularly-published comic, which continued until 1984. In the early 1990s, a few of the Dell issues were reprinted by Harvey Comics. It was, however, in the comic books that a couple of supporting characters were introduced. In New Funnies #182 (1952), Woody rescues a pair of woodpecker boys named Nuthead and Splinter from a tiger. Over the next few months, Nuthead's name metamorphosed into Knothead, Splinter metamorphosed into a girl, and they were retconned into Woody's nephew and niece. As such, Knothead and Splinter later turned up in the cartoons." In an interesting twist, in this month's issue of New Funnies, Woody gets wind of a fluke snow storm hitting town and barricades his home to protect himself from the element. The first part of the story we constantly hear "Knock knock" from the outside! It's his neighbour inviting himself over for an impromptu picnic. Very ironic role reversal from Woody's first appearance. One wonders if this was intentional or simply serependous. Probably for about $1. Nobody loves the Lantz books! AWP!! Where did the Kelly story appear? I like the art on the Oswald story better than the rest. No ideas about the artist? Bob and / or Ed should know if that's true. I do recall Bob mentioning some Kelly work on Andy Panda around the same period in New Funnies.